This ancient Viking port is steeped in medieval history. The most fascinating sites here are the 12th-century Fantoft Stave Church with its rooftop dragons; Haakon's Hall, where the Norwegian kings were crowned; and Troldhaugen, the lakeside home of composer Edvard Grieg. 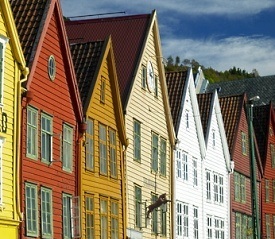 Some tours include the Old Bergen Open Air Museum and the Bryggens Museum, but both are worth a visit on your own.